One of the best experiences I have had in my life occurred on my honeymoon. As with every honeymoon, you try to do something that is extra special. 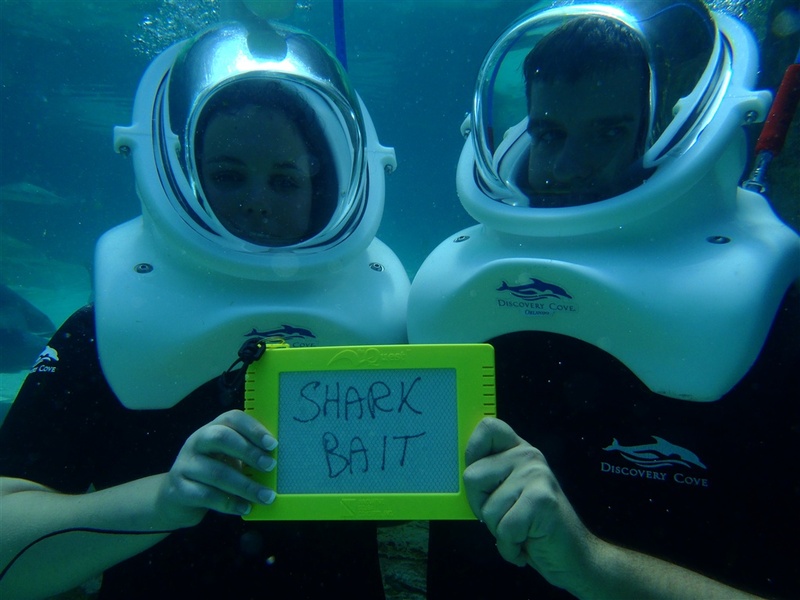 Since me and my wife being theme park people, one option was clear, Discovery Cove. Discovery Cove is an oasis in Orlando. Once you enter the gates, you will completely forget that you are in the middle of a major city. Sure, the occasional airplane will bring you back to reality, but this place is simply amazing. It is what I picture the Garden of Eden to have been like. Simple perfection, simple paradise. For a fee that ranges anywhere from $150 range in the colder months, to in excess of $200 per person during the summer months, you get an all inclusive ticket that will get you access to this paradise. With your paid admission, you will get access to snorkeling on tropical reefs, all your food and drinks, and a day without turnstiles and crowds. You can also pay extra (it was $50 when I visited) and recieve admission for 7 consecutive days to Sea World, Busch Gardens Tampa, and Aquatica. Discovery Cove limits the number of guests that enters the oasis to around 1,000 people per day, which allows this boutique park to feel even more special. Keep in mind that when I say all your food and drinks, I mean ALL your food and drinks. The thing that truly sets this place apart is how close you can get to the animals in the park. You can literally reach out and touch rays, snorkel besides tropical fish and sharks, and feed birds with your hands. The dolphin swim is the signature attraction of the park, but if you would like to save a bit of money, you can opt out of the dolphin swim. Since it was our honeymoon, we swam with the dolphins, which was truly memorable. However, when we go back (and we will), we are planning on opting out of the dolphin experience to save a little cash. 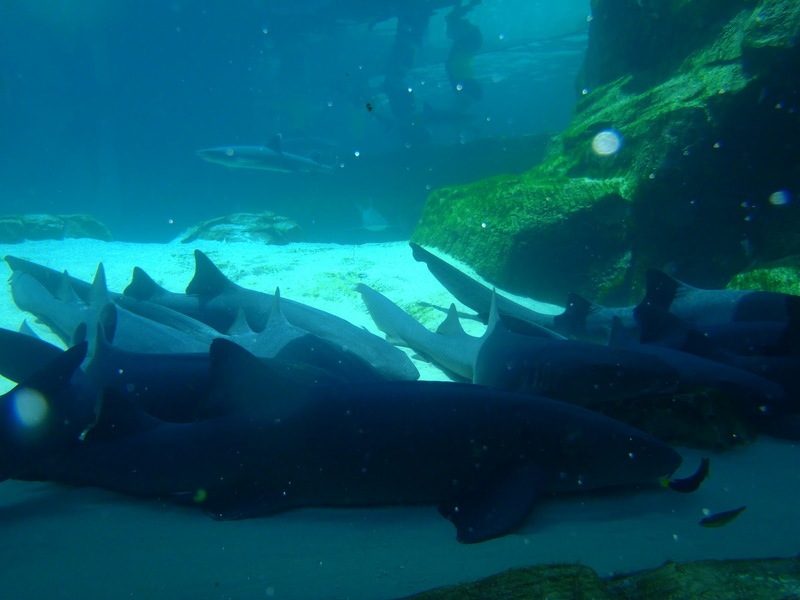 While it is exciting to actually touch and swim with those amazing creatures, the park offers plenty to do without paying the extra for it. When we arrived at Discovery Cove for our trip, SeaVenture had just opened. Think of SeaVenture as an old school scuba diving experience. You are given a helmet that that acts like a cup under water when in place. It gives you a pocket of oxygen that will allow you to walk on the floor of the reef. Scuba certification is not needed for the upcharge experience. 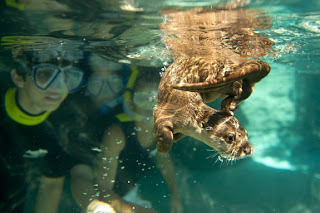 Once you are submerged about 20 ft. down, you are literally walking on the floor of the Grand Reef which offers you an opportunity get up close and personal with a wide array of animals in their natural environment. It is an amazing experience! 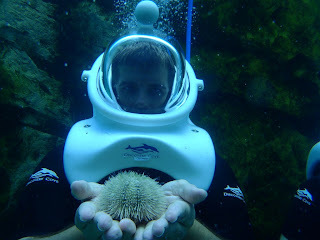 You can pay a bit more and get a copy of pictures you take with an underwater digital camera (hence how I got these shots). If it is your first time and you love animals, I suggest paying for it as they help the memories last. You can also pay for a video of your dolphin swim, which is also a cool souvenir, but a pricey one. My wife uses them in her science class and I like to look at them and remember what was a perfect day in the Oasis of Orlando. 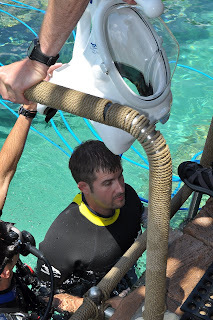 Discovery Cove is an outstanding experience that I recommend everyone experience at some point. It is pricey, but we never felt like we did not get what we paid for. Overall, it is a great experience that I am looking forward to visiting again in the future because the best keeps getting better with the addition of Fresh Water Oasis. 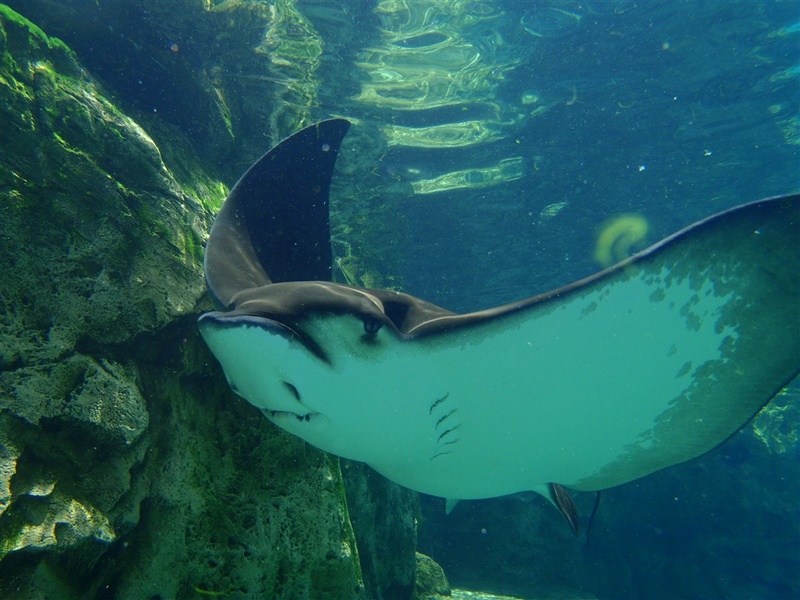 © 2012 Sea World Parks & Entertainment, Inc. All rights reserved. Fresh Water Oasis is a new experience that opened for summer 2012. It features a water-filled wading trail that offers guests the opportunity to get up close and personal with marmosets and otters. It sounds like another outstanding experience and a wonderful addition to the park. I look forward to visiting this new attraction one day. Discovery Cove truly is paradise. It is unlike any other experience we have ever had in a theme park. I encourage everyone to take some time out of an upcoming trip to Orlando and visit this wonderful place. If you have any questions or comments, you can leave them here or tweet me @MrX_381 or @Parkscope. You can also find us on Facebook! All pictures not marked otherwise were taken by my wife and me on a recent trip to Discovery Cove. I am sure, like most people, you just want to have some fun and admire these lovely creatures. No offense but if you support Sea World or operations like this, you are supporting the enslavement and exploitation of highly-intelligent creatures like Dolphins and Killer Whales. Creatures that understand what it means to be a slave. See the movie "The Cove" to understand what you are really supporting with your dollars. For most people, Ignorance really is bliss, however it is also destroying the earth.